Don’t Miss Women’s Jazz in Palm Springs! 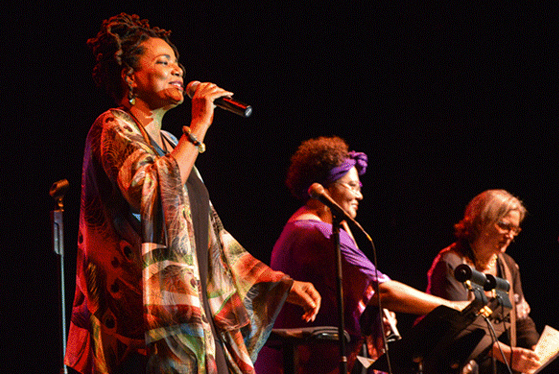 Home » Don’t Miss Women’s Jazz in Palm Springs! 19 Jun	Posted by Robin Lowey in • Guest Writers | Comments Off on Don’t Miss Women’s Jazz in Palm Springs! The resurgence of jazz as a popular music genre has been taking place over the last few years thanks to iconic pop musicians like Queen Latifah, Lady Gaga and Cyndi Lauper who have released albums of jazz standards, introducing the Great American Songbook to a new generation. The Palm Springs Women’s Festival debuted in 2013 with an all-star line-up of women musicians led by multi-Grammy-winning drummer Terri Lyne Carrington and featuring saxophonist Tia Fuller from Beyonce’s all-female touring band. Since then major artists like vocalists Dee Dee Bridgewater and Diane Schuur have helped to make this festival a serious musical event. In November the Festival will celebrate its 5th anniversary with a line-up of 25 female musicians that includes two of the hottest young vocalists currently on the jazz scene, Kandice Springs and Jazzmeia Horn. Since its inception five years ago more than 125 women musicians have come to the California desert to turn Palm Springs into a mecca for women’s music once a year. The producers of the Festival, former television news correspondent, Gail Christian, and accountant, Lucy DeBardelaben, have a long history in women’s music having worked on the east coast music festival, Sisterfire, a major festival during the 80’s. They are joined by one of the most talented artist in women’s music today, Sweet Baby J’ai, the jazz festival Artistic Director, and a prominent part of the Olivia performance roster. The jazz festival sees itself as more than an opportunity to hear good music. It is also a place where women come together to enjoy the company of other women. There is the traditional pool party associated with women events and everything from painting classes to a casino party to tours of the city. There are a variety of hotel packages available and individual concert tickets go on sale July 1. This year the Festival shares the Palm Springs Pride Weekend, November 2-5, 2017 and there are a number of after-concert Pride parties. This is one of the most racially diverse women’s events in the country and includes women from more than 30 different cities around the country and from Canada and the Caribbean. The Palm Springs Women’s Jazz Festival takes place November 2-11, 2017 in Palm Springs, California at multiple venues including the Annenberg Theater at the Palm Springs Art Museum. For details about the festival visit PSWomensJazzFestival.com or call 760-416-3545.